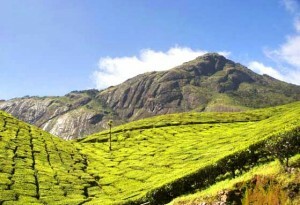 Munnar (55 km from Idukki town) is situated at the confluence of three mountain streams – MudrapuHa, Nallathanni and Kundala. 1600 m above sea level, this hill station was the summer resort of the British Government in South India, Sprawling tea plantations, picture book towns, winding lanes and holiday facilities make Munnar a popular hill station, among the exotic flora found in the forests and grasslands here is the Neelakurinji. This flower, which bathes the hills in blue once every twelve years, will bloom next in 2006 AD. 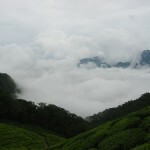 Munnar also has the highest peak in South India, Anamudi, which towers over 2695 m. Anamudi is an ideal spot for trekking. Mattupetty (13 km from Munnar): Situated at a height of 1700 m, Mattupetty is famous for its highly specialized dairy farm – the Indo Swiss Livestock Project. Over a 100 varieties of high yielding cattle are reared here. Visitors are allowed into three of the 11 cattle sheds at the farm. The Mattupetty Lake and dam, just a short disance from the farm, is a very beautiful picnic spot. 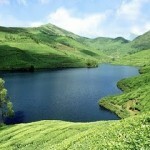 The sprawling Kundala tea plantations and the Kundala Lake are other attractions in the vicinity. Rajamala (17 km from Munnar): The natural habitat of the Nilgiri Tahr, Rajamala is 2695 m above sea level. Half the world population of the rare mountain goat, which is fast becoming extinct, is now found here. The Nilgiri Tahrs are today reduced to small herds, which are found in the Eravikulam – Rajamala region. 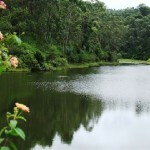 Marayoor (40 km from Munnar): This is the only place in Kerala that has natural growth of sandalwood trees. 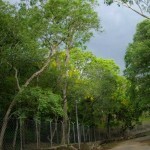 The sandalwood factory of the Forest Department, the caves with murals and relics from the New Stone Age and the children’s park spread across a hectare of land under the canopy of a single Banyan tree are of great interest to tourists. Devikulam (15 km from Munnar): This idyllic hill station with its velvet lawns, exotic flora and fauna and the cool mountain air offers a rare experience to visitors. The Sita Devi Lake with its mineral water springs and picturesque surroundings is a good picnic spot. The lake is also ideal for trout fishing. Top Station (32 km from Munnar): 1700 m above sea level this is the highest point on the Munnar – Kodaikanal road. The rare Neelakurunji belongs to this region. Top Station also offers a panoramic view of the neighboring state of Tamil Nadu. 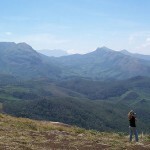 This entry was posted in Kerala, Munnar and tagged about munnar, Devikulam, hill view munnar, hillview munnar, Kerala munnar, Marayoor, Mattupetty, munnar details, munnar guide, munnar images, munnar in, munnar india, munnar inn munnar, munnar kerala, munnar kerela, munnar lake, munnar map, munnar photo, munnar photo gallery, munnar photos, munnar pics, munnar picture, munnar pictures, munnar places, munnar places to see, munnar sight seeing, munnar site, munnar tour, munnar tours, munnar travel, places to visit munnar, Rajamala, Top Station, windy hills munnar. Bookmark the permalink.